Throughout the adventure of divorce there continues to be subtle slices of life and symbolic moments which represent the end of my marriage… Court documents providing my offspring with an unwelcome moniker (The Timeshare); finding out it was finally over on Facebook; finding “HER” things in my nightstand; and other little markers and milestones along the way which made me laugh, cry, run in the rain, or pour a big fat glass of something. The drama has dissipated and I’m happily settling into my new life, but occasionally, out of nowhere, another metaphor materializes. This weekend when the movers delivered my portion of the contents from the “former matrimonial home”, I walked in to a sea of boxes labeled HER. At first it was amusing. Then, the Ouch. HER is me. There was an US, and now I’m just a HER. I can’t help but visualize the other boxes…was it a room of HER and HIM? 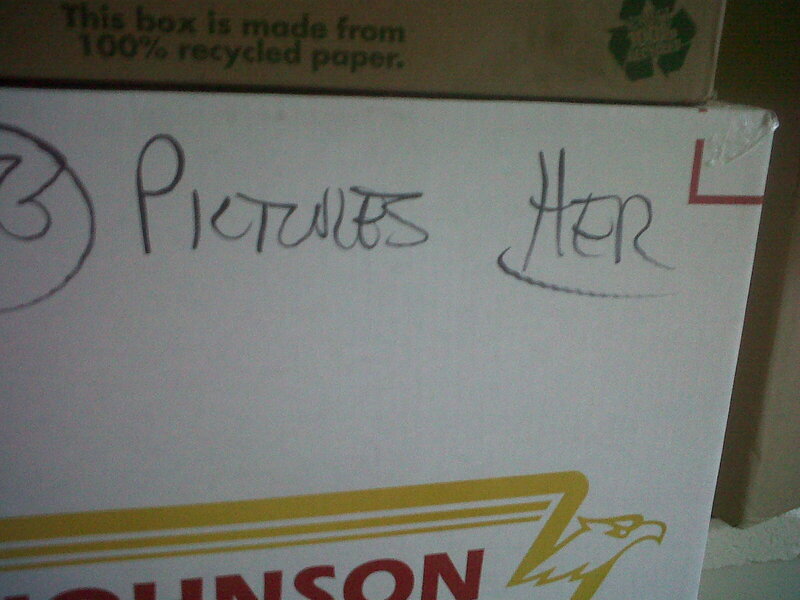 Or was it boxes and boxes of HER AND ME? HER and MINE? Or possibly just HER and NOT HER. No more US and no more OURS. Except for one, precious thing that will forever remain ours. Thank god for that sweet little timeshare, because despite the loss, the lawyers, and the labels…I will never, ever regret my marriage.